Whether it's Mother's Day, Valentine's Day, a friend's birthday, or simply because you're in the doghouse, put a smile on someone's face with a fresh bouquet of flowers. Get the pick of the bunch from The Blossom Shop. We deliver flowers same day in and around Woodford Halse. 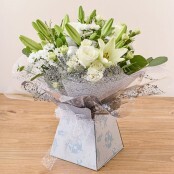 Please order before midday to guarantee same day flower delivery in Woodford Halse. Our professional florist has natural flare and has been further trained to design and create stunning arrangments, be they modern, classic or contemporary, and can work to your colour schemes, flower preferences or simply to a budget. Pop into the shop, or ring and speak to Ali, to ensure you get exaclaty what you want. Your satisfaction is important to us, as we want to put a smile on everyones face when we deliver.